Adams County, population 441,603 (2010), includes some of the northern suburbs of Denver, extends east for 70 miles into the plains and wraps around Denver International Airport. Within this fast-growing region, Adams County aims to preserve it best remaining agricultural lands as well as the floodplains and habitat areas that flank the South Platte River which bisects the western part of the County. Section 3-28-03-06 of the Adams County Development Standards and Regulations, dated 2005, include provisions allowing transfers of development rights through the planned unit development (PUD) process to provide economic relief and alternatives to landowners subject to development restrictions within floodplains, habitat areas, significant agricultural lands and areas affected by the Denver and Front Range airports. Farmland of national or state importance and grazing lands of local or regional importance. Airport Influence Zone, meaning the area included in the Noise Overlay for the Denver International Airport and the Airport Influence Zone surrounding the Front Range Airport. Preservation of a sending site occurs by permanent conservation easement granted to the County or to a land trust recognized by Great Outdoors Colorado and certified by the Land Trust Alliance. 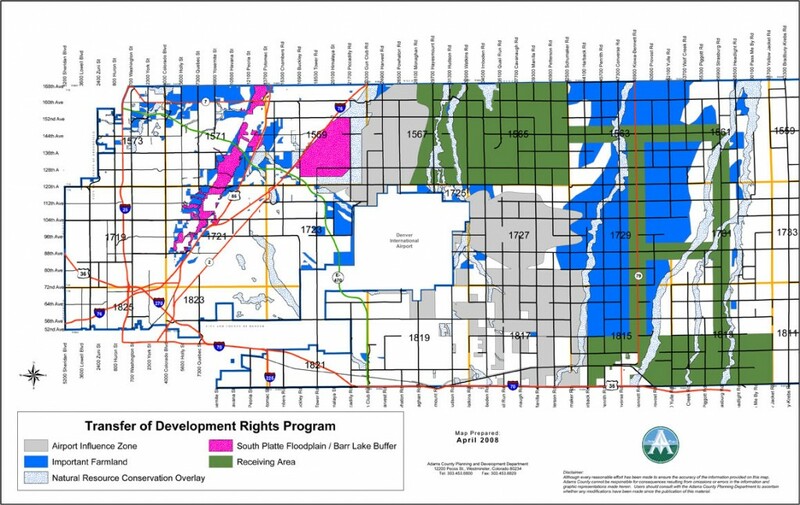 TDRs are allocated based on the underlying zoning of the sending areas, which typically means one TDR per 35 acres based on the mandate in Colorado state law requiring local jurisdictions to allow land divisions with a minimum lot size of 25 acres. Adams County then applies the following transfer ratios based on the nature of the sending area. Airport Influence Zone – 5:1. Receiving sites cannot include land that qualifies as a sending area. Furthermore, the six receiving areas are identified geographically in the County’s Development Standards and Regulations. For example, one of these six receiving areas is described as follows: “The southern three (3) miles of the County around Bennett and Strasburg excluding the Front Range Airport Influence Zone, the incorporated areas of Bennett, and the Natural Resource Conservation Overlay areas. To use the TDR process, receiving site projects must be approved as PUDs. Permitted uses in these receiving site PUDs are those uses consistent with the RE, A-1 or A-2 zones. The baseline is the number of units that would be allowed according to the underlying zoning. All units exceeding baseline are considered bonus units and each receiving site project is limited to no more than 200 bonus units. Receiving areas must be at least 160 acres in size but can be as small as 40 acres if contiguous with a rural residential development with a density of one unit per ten acres or greater or part of an Overall Development Plan.